"Anything less and we could get wiped out by 12 points again"
Monaghan's Drew Wylie and Peter Harte of Tyrone. 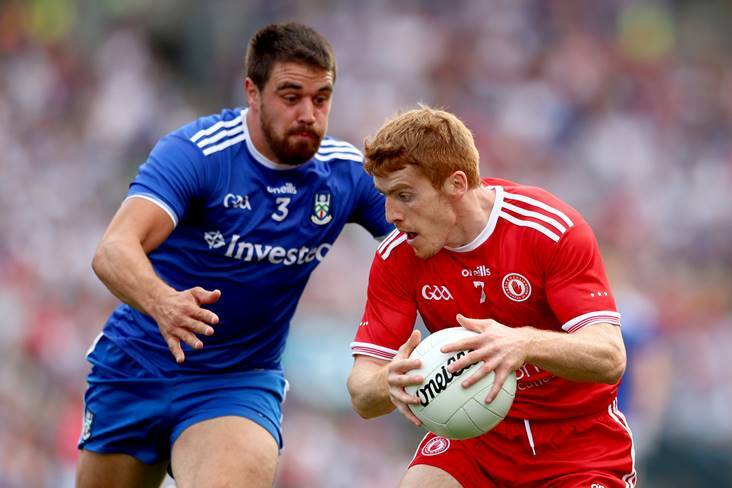 Peter Harte says Tyrone must rise to the occasion and not get "bogged down in the brilliance" of Dublin when the two sides cross swords in Sunday fortnight's All-Ireland SFC final. The Red Hands will face the Dubs in what is their first Sam Maguire Cup decider in an even decade and Harte knows they'll need to handle a new kind of pressure at Croke Park if they are to tear up the script. "An All-Ireland final pressure is different," he told The Irish News. "I was speaking to Mattie (Donnelly) and in 2008 we were in a minor final and we felt the build-up that time with the Tyrone seniors there too. The whole county was buzzing. "That will bring its own nervous excitement, but we have to use it, harness it and get our best performance on the day because anything less and we could get wiped out by 12 points again."